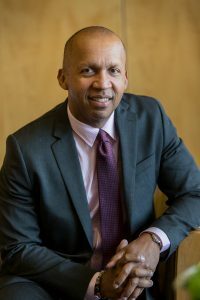 An exclusive interview with Bryan Stevenson, author of Just Mercy and founder of the Equal Justice Initiative. Speaking at Seattle Pacific University for a special chapel service, Bryan Stevenson, author of Just Mercy and founder of the Equal Justice Initiative, said that Christians cannot ignore the suffering of the millions of Americans caught in an unjust criminal justice system. “I believe that we are called as people of faith to respond to these great challenges that are in our community,” he said. With the U.S. having the highest rates of incarceration in the world, he made a case for “being proximate” to people who are suffering as a result of the harm done in these systems. Based in Montgomery, Alabama, Stevenson, also a professor of law at New York University School of Law, has represented many people on death row and received national acclaim for his work challenging bias against the poor and people of color. Stevenson is the author of the New York Times best-seller and memoir Just Mercy, which personalizes his many fights against injustice. In his book, Stevenson talked about defending some of America’s most rejected and marginalized people. Stevenson was the guest speaker during SPU’s chapel on Tuesday, March 28. Later that evening, he spoke at Seattle’s Benaroya Hall as part of his sold-out Seattle Arts & Lectures series event. 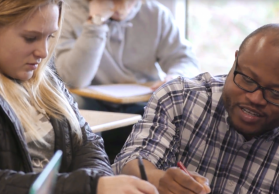 That event was co-presented by Seattle Pacific University, Seattle University, and the University of Washington. 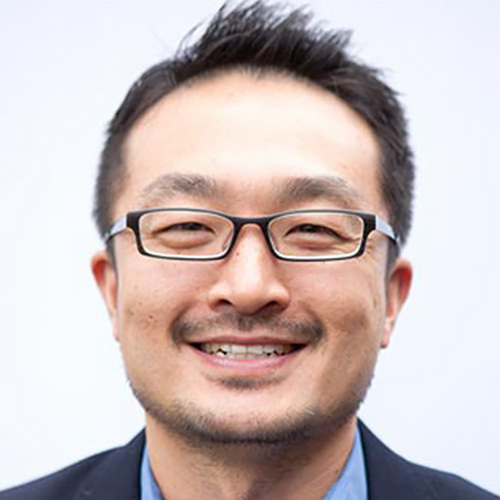 He spoke with SPU Chaplain Bo Lim about his call to seek justice, our prison system, and the hard work of staying hopeful in the face of tremendous injustice. Here are some edited excerpts from their conversation. Bryan, I’ve heard you share a story about your grandmother having this incredibly formative role in your life. How were the church and your education formative for you in your pursuit for justice? We grew up during a time where there was segregation, and where black people just couldn’t have a space to be heard, to talk. The church actually became that place. We were encouraged there. We were affirmed there. But we were also taught that no matter how excluded we were or how disfavored we were that we weren’t supposed to respond to that exclusion with anger or hate. We were supposed to overcome it with love. That became a defining orientation for me in the work that I do. I really do believe that there is something transformative when we don’t replicate the oppression and abuse and inequality that we experience by treating others in unequal or oppressive or abusive ways. We transform these problems when we don’t just mimic the injustice that we experience. I was a young musician growing up in my church. And when you were still learning, they would make you play during the testimonial services. People would come in, and they’d give their testimonies, and then they’d start singing. You’d have to find what key they were singing in, and all of that, but I used to love those. I remember these older people would come in sometimes and they would give these testimonies that were heartbreaking, about the hardships they had endured, about not having enough food to feed their family, about children not being able to get the things they needed without someone being gone. But they would always end those testimonies by singing “Wouldn’t Take Nothing for My Journey Now.” And when people started singing that, it just did something to the temperature in that space. And it made it joyful and triumphant even in the face of hardship and pain. It was really important for me to attend a Christian college. 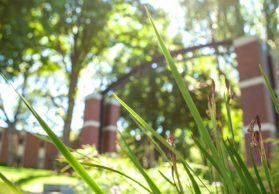 To me, having the opportunity to integrate faith with what I was studying — it didn’t constrain education. It actually opened it up. By the time I graduated, I was absolutely persuaded that you change the world not just with the ideas in your mind, but you change the world when those ideas in your mind are fueled by some conviction in your heart. I never wanted to leave my heart out of the choices that I made with what kind of career to pursue, what kind of work to do. 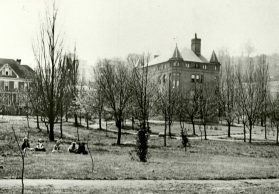 I credit the educational experience I had at Eastern University and the faith experience I had growing up with that orientation. People say, “How can you represent people on death row?” For me, it’s rooted in the experience of growing up in a church where we were taught to not be defined by hardship and pain, but to be oriented to triumph and recovery, which continues to shape my world. There’s a particular parable that Jesus tells in Matthew 25 that’s always haunting for me. It’s the parable of the sheep and the goats. In that parable, he names caring for those in prison as part of what characterizes those who receive eternal life. What does it mean for us to care for those in prison in light of the system of imprisonment that we have? Jesus was very clear about what we were supposed to do when it comes to providing clothing to those who are naked, and food to those who are hungry, and shelter to those who are homeless, and fellowship and service to those who are in jail or imprisoned. I mean, he’s very explicit. Jesus often spoke in parables, but he would often be very direct about what we are called to do. We’re living in a time when the prison population in this country has never been larger. We are defined by this era of incarceration. We’ve become the most punitive society on the planet. And I just think that the church has to respond proportionately with the new threats that are created by this over-incarceration. We have to be at the forefront. I just don’t think we’ve responded the way we’re called to in the gospels. We’ve got to change that. Fortunately, the opportunity is everywhere. You don’t have to live in a certain part of the country to be active on issues of supporting and helping and responding to incarcerated people, whether you live in Seattle or you live in Mississippi or you live in Maine or you live in Minnesota. We have incarcerated people in every state and every community. I would just love to see the church be more explicit and intentional in its ministry to the incarcerated and formerly incarcerated. 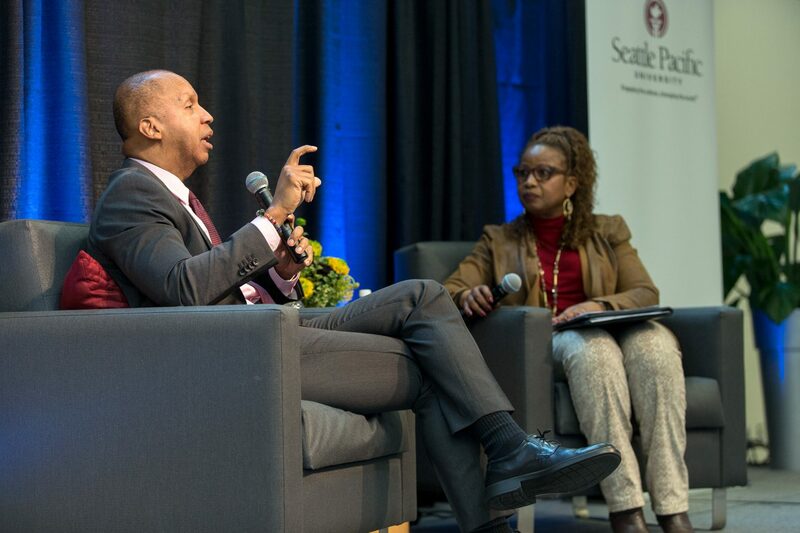 While visiting Seattle Pacific, Bryan Stevenson was also interviewed by Brenda Salter McNeil, associate professor of reconciliation studies and director of reconciliation studies at Seattle Pacific University. There is a vigorous debate here in Seattle about whether to build a $225 million youth jail and court building. From your experience, what concerns are often ignored or forgotten in discussions on juvenile justice? And what are some possibilities and opportunities people have not considered in our treatment of young people? What we know is that carceral environments are very bad for kids. I mean you’re not going to achieve the kind of intervention that changes the lives of children when you’re telling them in every way possible that they’re so worthless, dangerous, and messed up that they have to be caged. And so I just don’t think it’s a good investment to spend millions of dollars building new cages for kids. What I think we need to do is instead invest in services for children. We know why there are so many kids that are engaged in criminal activity. We know why there are kids that are struggling. And I think it has to do with an epidemic of trauma. We’ve got too many kids in America that are born into violent families. They live in violent neighborhoods. They go to violent schools. By the time these kids are 4 and 5 years of age they have trauma disorder. What we need to be doing instead of threatening them with a bigger and more expensive jails and prisons; instead of making them go through metal detectors; instead of talking to them like they’re inmates — what we ought to be doing instead is wrapping our arms around these children and trying to make them feel like they can be safe. And that’s a mental health intervention. It’s a counseling intervention. I would much rather see this community spend tens of millions of dollars funding mental health services for all children in at-risk communities and neighborhoods at ages 4 and 5 and providing safety for those children than to build some big jail, some warehouse that waits for them. If we invested the money in care and treatment we wouldn’t need a new jail. We wouldn’t need all of these beds. I think we should actually have an aspiration of eliminating youth crime — I don’t think that’s a crazy objective. If you say you’re trying to eliminate youth crime, you’re not going to spend money building youth jails. You’re going to spend money building interventions that keep kids in situations where crime and criminality is not their future. When you invest in jails, you’re just waiting for kids to commit crimes. I just don’t think that’s a healthy way to move forward. I’m struck by the title of your book, Just Mercy. For those who’ve read it or have seen the documentary 13th, people will learn about how so many of our laws, our law enforcement, our judicial system is unjust. I’m curious to hear why you chose to use the word “mercy.” Is mercy to be in support of justice? I was intentional about the name of the book, because I think we have justice systems that are just punishment. They’re just punitive, and we don’t actually value mercy. I also use the terms to mean just mercy — that is, mercy tempered by justice, shaped by what is just. We’ve gotten very hierarchical about mercy. We’ve gotten very conditional about mercy. We don’t want to give people mercy unless they meet our conditions. That’s not really mercy. Mercy is what you give to people who don’t deserve it. Mercy is what you give to people who can’t make the showing that you would like them to make. You make that showing of mercy not just for them but also for you. What I think mercy requires is that we understand human need and respond to it. I think people are fearful that if we insert mercy into this process of justice that we will abandon justice. Do you have some examples of what a more merciful justice could look like? I think it looks like not putting people in jails or prisons unless they’re a threat to public safety. If somebody writes a bad check for $30, we can put them in prison for five years. We can spend $40,000 a year to keep them in prison. So their $30 check becomes a $200,000 burden on the local government. Why are we doing that? We’re not doing that because that’s justice. We’re doing that because it’s tough. We think that toughness is the same thing as justice. It’s not. A merciful system would say: You know what? We’re going to want you to be held accountable, and we’re going to want you to pay back that money. And then, if there are other costs that need to be paid we’re going to ask you to pay those costs too. Mercy would reject policies and punishments that are extreme and excessive and not rooted in something that is committed toward rehabilitation. And I think that means not putting people in jails or prisons for simple possession of marijuana or low-level drug crimes. Not putting people in jails or prisons for low-level property crimes. Not having sentences that are disproportionate to the culpability of the offender. For instance, people with disabilities — schizophrenia, severe mental illness — engage in behaviors that get them arrested. And the judge legally cannot consider that culpability, that disability, in the case of mandatory sentencings. And I just think that’s unjust. There’s no room for mercy. And I think when we do that we treat people cruelly. And I actually think there is a lot of cruelty, a lot of abuse, a lot of injustice, a lot of behavior that, when I read the scriptures, is an affront to the gospels. It’s an affront to the calling of Christ. If I had a lot of money, what I would do is offer money to the wardens and the correctional officers who produce a pool of people coming out of their prisons who have the lowest recidivism rates. I would want to put the money right in the pocket of the wardens and the correctional officers themselves. Just think how that would radically change correctional environments. All of a sudden, you’d have wardens and correctional officers worrying about drug treatment, worrying about anger management, worrying about keeping families in contact with the people in their jails and prisons. They’d be facilitating visits with families rather than interrupting them, because they would know that that person’s likelihood of staying out of prison is going to depend on whether they have those kinds of relationships, those kinds of connections. We say we have systems that are “correctional” but we’re not really correcting anything. There is a way of having mercy define and organize our policy making that would create very different policies. I notice that the Equal Justice Initiative sponsors the Race and Poverty Project. In 2013 it published a study on the slave trade in Montgomery. In 2015 it produced a study on lynching in Southern states that demonstrated that the number of lynchings in these states was more than 20 percent higher than previously reported. But EJI’s main focus is on legal assistance. 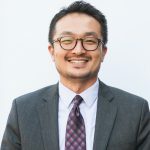 How did you move from legal assistance to these historical studies — and what is the connection between the two? I went to law school in part because my opportunities to move forward were created by lawyers. 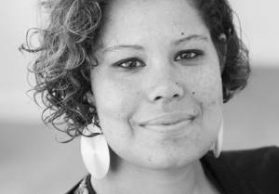 I started my education in a “colored” school and it was Brown vs. Board of Education that forced my community to be responsive to my desire for education. There was never a time you could get the majority of people in that community to vote for racial integration. It took the rule of law. And that’s what I’ve been doing for nearly 32 years. About nine or 10 years ago, I realized that these legal institutions were also being influenced by larger narratives, by an environment that just tolerates a certain kind of inequality, that tolerates a certain amount of bigotry and bias. For me, it became necessary to recognize that no matter how skilled we are as lawyers, how effective and strategic we are, if we don’t get the decision makers, the judges, and the policy makers, to aspire for more equality, aspire for more justice, we’re not going to achieve the outcomes that we seek to achieve. Then we started asking how we change the thinking of these decision makers. That required changing the way we talk and think about these issues of race, talking about this narrative of racial difference, of racial inequality. We decided to do a report on slavery, because in Montgomery the landscape is littered with the iconography of the Confederacy. We love talking about mid-19th century history in Alabama, but we don’t like to talk about slavery. At EJI, we feel like that has to change if we’re going to get to a healthier place. After the slavery report, we decided to take on lynching. We’ve now been documenting these lynchings, and it’s been really powerful to understand the true histories of these communities. Our next report will be on segregation. I’m interested in the resistance story — all those people who were holding signs that said, “Segregation Forever,” “Segregation or War.” What happened to that sentiment? What happened to those signs? I don’t think they were destroyed. I think they were just altered. And that alteration manifests itself in all the same ways that resistance to civil rights manifested itself. We can’t complete the justice-reform work we want to do through litigation in courts until we create a better, healthier environment for justice outside of courts. That means talking about poverty. It means talking about race. It means talking about our integration of what we believe on Sunday and what we do on Monday through Saturday. 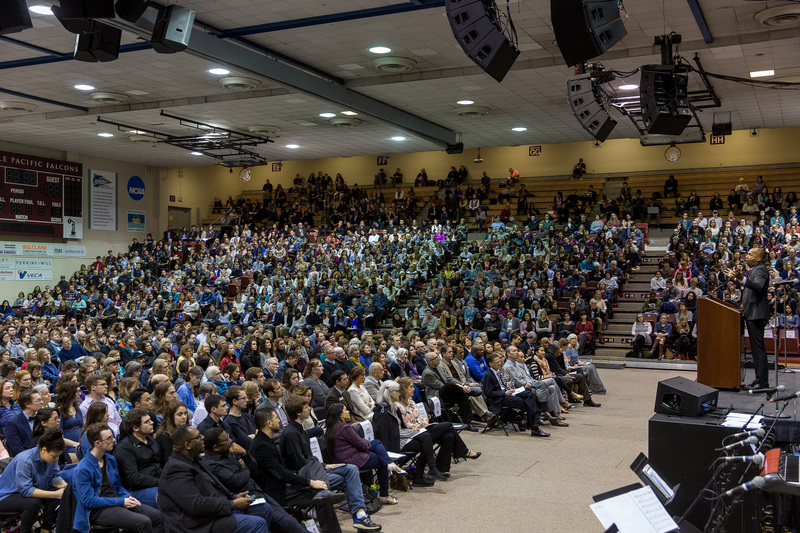 Bryan Stevenson speaks during an SPU chapel service in Royal Brougham Pavilion. Photo by Daniel Sheehan. For our students who want to make a difference on these issues of race and justice, particularly in our justice system, what advice would you want to give them? You have to be prepared to struggle. I have great confidence that the young generation that will carry on this work. They’re more talented, they’re more informed, they’re more exposed, and educated. They have a lot of strengths and gifts. And the only thing I worry about is: Are they prepared to struggle? And so my advice is: Be prepared to struggle. Don’t get turned around easily. Don’t insist that everything be comfortable and convenient. Be prepared for uncomfortable and inconvenient. And if you have that orientation, then there’s nothing you can’t do. When I was a college student I had no idea that I’d end up practicing law and doing some of the work that I’ve gotten to do. I never met a lawyer until I got to law school. I had to believe in something I’d never seen. For young people of faith, believing things that we haven’t seen — that’s what defines who we are. Believing that we can create a community that is better at justice, better at equal treatment, better at overcoming racism and bigotry against the poor is essential — and then struggling to achieve those things — that’s the work. It sounds hard, but it’s actually glorious. It’s wondrous. It’s energizing. It will make you feel privileged to have a purpose and that that purpose can be integrating what you believe in your heart with what you see and understand with your mind. That’s an exciting way to live.